One of last year's more unexpected cinematic success stories, at least from a box-office perspective, was "God's Not Dead," a low-budget Christian-themed drama about the campus-based battle of wills that develops between a hard-hearted philosophy professor who required his students to literally sign a document avowing that God is dead and the earnestly devout student who unsurprisingly takes a somewhat different view and refuses to sign. The film was pretty awful—a frequently ridiculous stew of straw man arguments, stacked decks, an overwhelming persecution complex and an oddly peripheral subplot involving a liberal blogger out to really do a number on those Duck Dynasty guys—and it received largely terrible reviews. However, it clearly struck a chord with its core audience of evangelicals and Kevin Sorbo enthusiasts and went on to make upwards of $62 million worldwide on an investment of about $2 million. Clearly wishing to strike while the proverbial iron is hot, the producers and writers of that film have now returned with "Do You Believe?," a film that starts off on a reasonably restrained note but which quickly grows so ridiculously ham-fisted that it almost makes its predecessor seem reasonable and open-minded by comparison. Set in Detroit, the film is one of those multiple-narrative tales featuring a number of different subplots that eventually wind up coming together in theoretically unexpected ways—the kind of format largely developed by Robert Altman in such classics as "Nashville" and "Short Cuts," honed further by Altman acolyte Paul Thomas Anderson in his equally brilliant "Magnolia" and debased beyond belief by the atrocity that was "Crash." Here, our characters include a minister (Ted McGinley) inspired by the words of a mysterious street preacher (Delroy Lindo) carrying a massive cross, a pregnant teen runaway (Madison Pettis) that he and his barren wife (Tracy Melchior) take in, a church janitor (Brian Bosworth) who takes in a homeless mother (Mira Sorvino) and child (Makenzie Moss) while trying to disguise a cough that would give Camille pause, a born-again EMT (Liam Matthews) and his wife (Valerie Dominguez), her PTSD-suffering brother (Joseph Julian Soria), a suicidal young woman (Alexa PenaVega), an aging couple (Lee Majors and Cybil Shepherd) still reeling from the death of their daughter and a thug (Shwayze) who finds himself ready to repent for good following a robbery gone wrong. The opening scenes establishing all these characters and their various agendas are not particularly bad. Let me rephrase that—they aren't particularly good but compared to the lunacies of "God's Not Dead," there is nothing particularly objectionable to them other than giving the other members of the thug's gang (all African-American, by the way) such names as Kriminal and 40 Ounce and the admittedly weird sight of Mira Sorvino and Brian Bosworth acting opposite each other. Having accomplished that, however, screenwriters Chuck Konzelman and Cary Solomon apparently must have worried about alienating their base because this is where the preposterous plot developments kick in. In the most grotesque of the bunch, the EMT proselytizes to a dying accident victim instead of doing his actual job and winds up being sued for everything he has by the secular humanist widow and her money-loving, religion-hating lawyer (Andrea Logan White)—since he refuses to admit that he did anything wrong, his union refuses to support him and even his wife is about to abandon him. The lawyer, by the way, is married to a cynical doctor (Sean Astin) who refuses to believe in miracles and, in one especially astonishing scene, gets irrationally upset at the sight of a couple saying grace before eating and then goes on to lamely misquote Alec Baldwin's big speech from "Malice." 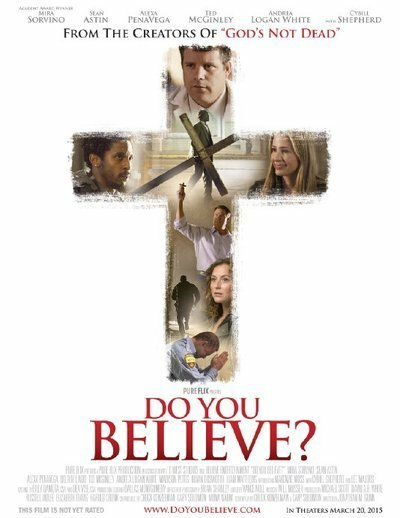 As it veers between the relatively grounded and the punishingly preachy, "Do You Believe?" demonstrates that while it may not be as convulsively awful as its predecessor, it is certainly a more schizophrenic moviegoing experience. There are some moments, such as the ones involving the relationship that unexpectedly develops between the soldier and the would-be suicide, that are handled by director Jonathan M. Gunn in a reasonably touching manner (perhaps not coincidentally, this plot thread is the least overtly religious-minded of the bunch). At other times, however, it seems to be going out of its way to throw in things to fire up the base regardless of how they may work from a dramatic standpoint—characters (especially the EMT's wife) find their behavior randomly switching from scene to scene with no rhyme or reason and the runaway tells the story of how she left home because her evil stepmother tried to trick her into an abortion. The finale, in which all of the storylines finally converge (and how) is exceptionally ludicrous and by once again relying on a traffic accident help tie things up in the end, Konzelman and Solomon seem to be suggesting that if there is a God, He or She is apparently a fan of the other, better "Crash." Subtle as a sledgehammer to the toes and only slightly more entertaining, "Do You Believe?" will no doubt play well with viewers already predisposed towards liking it because it has been designed to reconfirm their already deeply-felt beliefs rather than doing anything that might cause them to think about or challenge those beliefs in any meaningful way. Those who are not as heavily invested in its core message will probably find it laughable (though not nearly as much as "God's Not Dead," a film so risible that it is being screened next month at the 2015 American Atheists National Convention, complete with riffing by two of the guys from the late, great "Mystery Science Theatre 3000") and will likewise not find any reason to question their own personal value systems. This is a shame because I would rather see a movie that presents a opposing viewpoint in an interesting and provocative manner than one that merely parrots what I already believe in any day of the week. On the bright side, if "Do You Believe?" does make a splash at the box office—and it probably will—maybe it will bring Brian Bosworth back into the spotlight and make the dream that is "Stone Cold 2" a reality at last. For that, even I would be willing to take a knee.